The BioShock novel, telling the history of Rapture, has been re-tooled and is ready to go. In May 2009, Tor Books announced plans to release a BioShock novel later in the year. Those plans never came to fruition, and the novel went AWOL for a while, but it's reappeared and is scheduled for release on March 1, 2011. 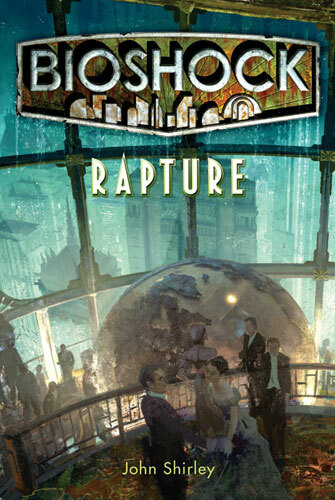 BioShock: Rapture was delayed so that characters from BioShock 2 could be incorporated into the tale, requiring author John Shirley to add another 30,000 words to its text. The apparently now thicker novel's premise is the history of Andrew Ryan's Rapture, the city he built under the sea to escape from government, religion, and censorship. In BioShock, that city pretty much went to hell, and BioShock: Rapture may fill in some of the blanks about how that happened. It'll also hopefully reveal how Ryan was able to build the massive Rapture under the sea, because that seems like a construction nightmare. Irrational Games head Ken Levine is currently working on BioShock: Infinite, but he took time out his his schedule to write BioShock: Rapture's introductory chapter. Rapture will be released in both paperback and hardcover versions, each with a different cover. The hardback will cost $27.99, and the paperback $14.99, but of course certain retailers tend to have lower prices. We aren't going to be able to find out Rapture's history from Andrew Ryan anymore, thanks to his golfing accident, so BioShock fans will have to rely on this novel instead. I'm not normally into books based on games, but the world of BioShock was interesting enough that I just might pick this one up myself.